We looked at some houses this weekend in some new areas that we were not all that familiar with which was a lot of fun. Weekend re-cap to come tomorrow. We are off to look at more houses tonight. It is really fun to get an idea of what is out there and I know that when we find the right house we will know it. Although, I am really starting to wonder. I also think that I am the one who is not going to get to make any decisions in order for the boy to be happy. The boy told his parents at dinner last night what our plans were. Needless to say they were not jumping up and down excited, more the opposite. I guess about the same reaction he had. I kind of feel like the consolation prize or the well, if that is really what you want to do. . .kind of person. It is definitely not the happy joyous occasion like I wish it was which is really making me feel kind of sad. I don't think that it helped matters much that the boy let his parents know that this was something he wasn't really on-board with but an idea that he is getting used to. Seriously???? I don't know, maybe I am just in the wrong place, it is days like today that makes me want to move back out East, be with my friends and just be happy again. I know I would miss my family, but if this is what I have to look forward to the rest of my life, someone who feels like they have to do something and not want to do something in order to be in a relationship and be happy with me? I do know and understand that this is a big and hard decision for him, but I guess I feel like no one thinks that this is hard for me too. I feel like I have sacrificed and given a lot to this relationship and he has just coasted and kind of taken. I just feel like I deserve the opportunity to be happy too, I wish that he would try to see things my way a little bit too. We looked at houses in a couple of new areas. Nothing in my neighborhood which makes me kind of sad because I really like my neighborhood and being so close to the lake. I really want to get out a lot this summer and walk around the lake. I love being so close to the water. When he told his mom about us moving in together, she was really negative right away saying things like, "well, he doesn't even like the same kind of houses you like" and just being kind of negative overall about being so much further away from where his current house is. In a way, I can kind of understand this because he has been so close to them for so long. But, realistically, we have spent two nights since August at his house, yet we still have Sunday dinner with them almost every Sunday. We still make plans to go to movies with them and we see them more than my parents. Maybe the boy is a true mama's boy and can't let go of her youngest, but he is 40 now, I think that it is time. He is not very good, nor has he ever been about sticking up for me or defending me. I always have to tell him this and point it out. I don't know if that is a guy thing, or maybe a sign that he just doesn't think about me as much. I really wish this was the happy momentous occasion that I wished and thought it would be, instead of this pit in my stomach and sadness in my heart. I have never really questioned my relationship with him until now. We have had our share of difficulties, but really, seriously, since the whole Navy thing, never anything really terrible at all. We have always gotten along really well and always have so much fun together. I guess I just wish that instead of feeling so sad about all of this, I wish I was super excited and felt happy. I also wish I could say maybe it will just take a little while, but if this is how things are going to be, why do I feel like this, will always be held over my head? Ugh! Sorry, venting, and just getting my thoughts out. I don't really have anyone I can talk to about any of this, so I guess it is just good for me to get it out through my fingers. Man, I wish I had my girls here from out East. I miss them terribly during times like these. Onto Meal Plan Monday! Dinner - We are re-creating the tomato, bacon, onion salad with buttermilk dressing that we had at Mission for my birthday, light and easy! 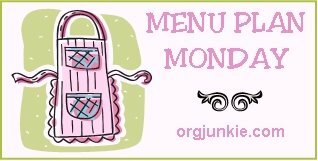 For more Meal Plan Mondays, links to other menus and recipes, check out the Orgjunkie! Sending a hug your way! I think things can be tricky when you feel like you are the doing more of the compromising and sacrifice and they just get to float along. As someone that isn't super close to my family I have a hard time understanding the need to clear decisions with them. I get keeping them informed and asking for their input but not letting them have that much power.